WASHOUGAL, Wash. -- Sweat beads on Les Clark's forehead as he shuffles a few feet from the controls of his 32-foot boat to pull fish from the nearby gill net. 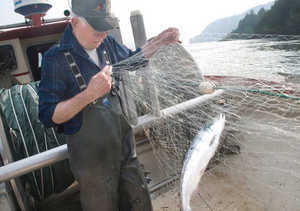 It's a nearly one-man show aboard his boat, and fishing regulators have given 79-year-old Clark and other commercial fishermen just a six-hour window to catch as many sockeye as possible in the Lower Columbia River. Miles upriver, just above Bonneville Dam, tribal fishermen are netting sockeye after sockeye from wood scaffolds anchored to large poles reaching over the water. For much of the past half-century, the returns of sockeye -- a fish listed as endangered in the Snake River in Idaho -- have been meager at best in the Columbia River. But this year, the fish commonly known as bluebacks are returning in numbers that haven't been seen since the mid-1950s, and both tribal and nontribal commercial fishermen are being allowed a swipe at the run. So far, an estimated 1,000 sockeye have been caught on this day in the lower river, which is open for commercial sockeye fishing for the first time in four years. Sportsmen get to keep two sockeye each a day through this weekend, while tribal scaffold fishing has no daily limits and is open year-round. So far, about 194,000 sockeye have passed Bonne-ville Dam, and the run this year is expected to surpass 230,000, making it the largest since 1956, said Columbia River Inter-Tribal Fish Commission biologist Stuart Ellis. It's quite a contrast from the mere 25,400 that returned last year, he said. "It's an enormous run and somewhat unexpected," he said. It's Monday, and it's hot on the river. A refreshing breeze sweeps across the bow of Clark's boat as he lets out his roughly 750-foot gill net in hopes of catching some bluebacks. His is among only a hand-ful of commercial fishing boats on the water. Most fishermen lack the proper nets for sockeye because there's so little opportunity to fish for them. Clark, a non-Indian from Washougal, allows his boat and net to drift before he reels in the net. He only catches a shad, a non-native member of the herring family originally from the East Coast. "It looks like it's going to be McDonald's tonight," quips Tize Tolva, a longtime fishing buddy who came along for the ride. "We'll have to go and buy (sockeye) from the Indians, I guess." Clark whips his vessel around and drops his net in a cove a few miles east of a rock wall, where he nets a handful. He works the area for the next few hours, pulling in handfuls of sockeye at a time. His catch for the day is about 30 fish totaling roughly 120 pounds. Commercial fish buyers are paying about $3 a pound for sockeye, so his catch will barely cover the day's cost of fuel for his boat. "We didn't lose any money, but we didn't make too much money either," said Clark, who has fished the Lower Columbia River for 65 years. "That's fishing -- sometimes you don't do so good and other times you do extra good." Tribal fishermen, how-ever, are getting up to $7 a pound for freshly caught sockeye -- considered the best tasting fish the river has to offer. Tribal members usually get a better price for fresh fish sold directly to the public than what commercial buyers pay. Among the smaller salmon species, an average sockeye weighs 3 to 5 pounds. Near Cascade Locks, Ore., about a half-mile east of Bonneville Dam, tribal members fish from about a dozen scaffolds that line both sides of the Columbia. Just above the river off State Route 14 on the Washington side, a sign reads "Fish for Sale" at the entrance of a nearby camp. Here, the public can buy fresh sockeye and steelhead from tribal members. "It's been good," Yakama tribal fishermen Andrew Zack said about fish sales. "We're just exercising our (tribal) treaty rights." His brother, Will, unties the handle of a large hoop net from the end of the 20-foot-long scaffold, and pulls up a blueback and a shad. He gently tosses the shad back into the river, but keeps the sockeye. After cleaning it, he immediately puts it on ice. "I've been hitting it hard," he said. "I filled my (coolers) quick and figured I'd better go and sell some." Shortly afterward, a car pulls into the camp and the driver forks out $21 for a three-pound sockeye. Yakama fisherman Lew George said he can't recall seeing so many sockeye in the river. "Incredible. I was probably in my early teens since the last time I saw fishing anything like that, and I'm 49," he said. Tribal members enjoy smoked and canned sockeye, he said, and having plenty on hand helps assure families are fed and that there is enough salmon for sacred ceremonies. "That's the main thing," he said. Biologist Ellis said more spills over dams, improved hatchery practices and strong survival rates among sockeye in the ocean are responsible for the large run. Most of the sockeye in the Columbia River are headed for Lake Wenatchee and the Okanagon River, and fisheries on the Columbia River won't have much impact on the Snake River run, he said. Longtime tribal fisherman Oliver Brigham said Idaho people must be praying hard for the fish. "It's been a lot of years they've been down in the dumps," he said of sockeye numbers. "Hopefully there will be as many next year." The large sockeye run helps after the spring chinook season was cut short because of low fish numbers, said Umatilla tribal fisher-man Cliff Shippentower, who often lets the Zack brothers use his scaffold. "It sort of makes up for that," he said. "It's real huge for us -- something that we don't get to do every year." Sockeye can measure as long as 33 inchesand weigh up to 8 pounds. 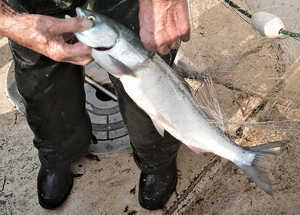 Sockeye caught in the Columbia River have been averaging from 3 to 5 pounds. They have a bluish-green back with a silver underbelly while in salt water. When they return to fresh water to spawn, their bodies turn bright red and their heads green. They spend up to three years in lake areas of streams before migrating to the ocean, where they live up to four years before returning to spawn. Fresh sockeye can be purchased by the public until at least the end of next week at tribal fishing sites along the Columbia River between Bonneville and McNary dams. To find specific locations to buy freshly caught fish, contact the Columbia River Inter-Tribal Fish Commission toll-free at 888-289-1855, or online at www.indiansalmonharvest.com. "These fish are the preferred fish," said Les Brown, fish marketer for the fish commission. "They've got wonderful oils in them, they average about 3 to 4 pounds and are a wonderful meal size."